To frappe or not to frappe: What’s your (American) dialect? To people overseas, America might at times seem like one big, homogeneous country with one culture, language, and dialect (or maybe two languages, English and Spanish, or the combination, Spanglish), but that’s far from true. People around the US all eat take-out sandwiches, but depending on where they live, they order subs, grinders, hoagies, heroes, po’ boys, bombers, Italian sandwiches, baguettes, or sarneys. When Americans drive around traffic islands, they call them variously roundabouts, rotaries, circles, traffic circles, or traffic circuses. There’s a really cool test constructed by the Harvard Dialect Survey, a linguistics project begun in 2002 by Bert Vaux and Scott Golder, to help “place” you within the US, based on the words you use and the way in which you pronounce them. I’ve tested it on myself, and on several friends, and it was remarkably accurate. And, if you want to see where in the world people with your last name live, go check out this post. This is fascinating. 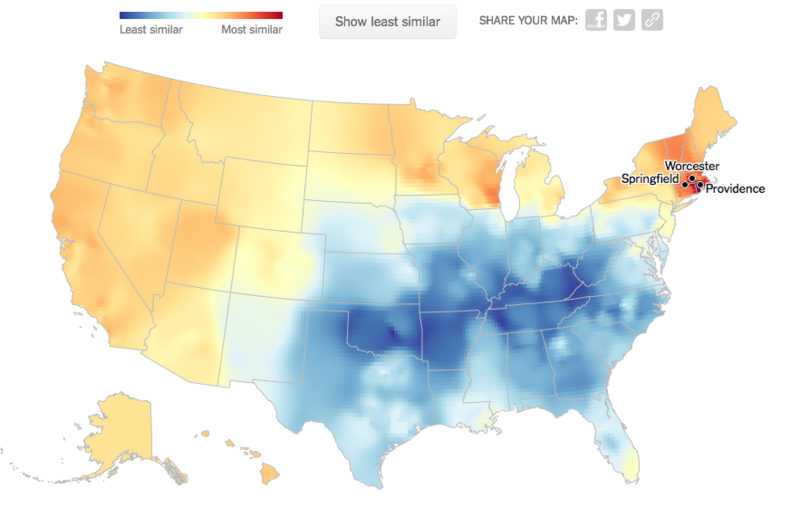 I tried it, not as I would speak, but as I reckoned people spoke where I lived (Mid West, Great Plains, absolutely smack bang middle of the country). The survey came up with three cities as my closest match: two in Wisconsin and Reno, Nevada. Not a bad stab!